This scarfiier is currently only available in yellow! The dethatcher is made in Italy. The manufacturer has invented this design and has the best experience. Many other companies have copied this system from this manufacturer. Gladly we offer you to look on the companys homepage on request. We sell this dethatchers since 2004 and have made the best experiences. 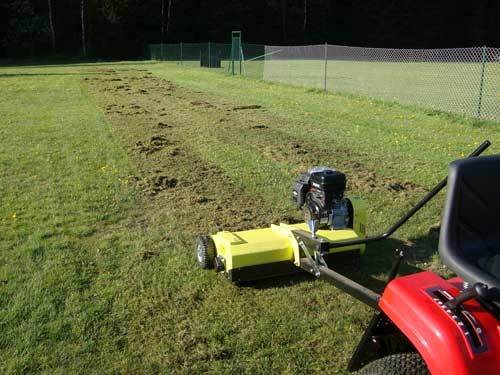 The scarifier is designed for large areas such as parks, sports fields or large garden areas. It can be used as a professional tool. The working width is 95cm. Also a proud weight of 127kg reflects quality. 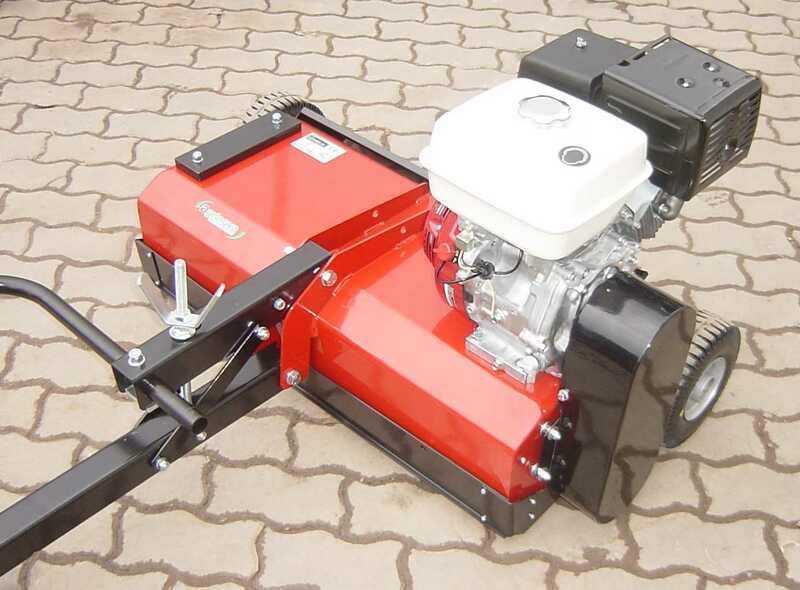 This scarifier offers a rugged construction and a large working width! 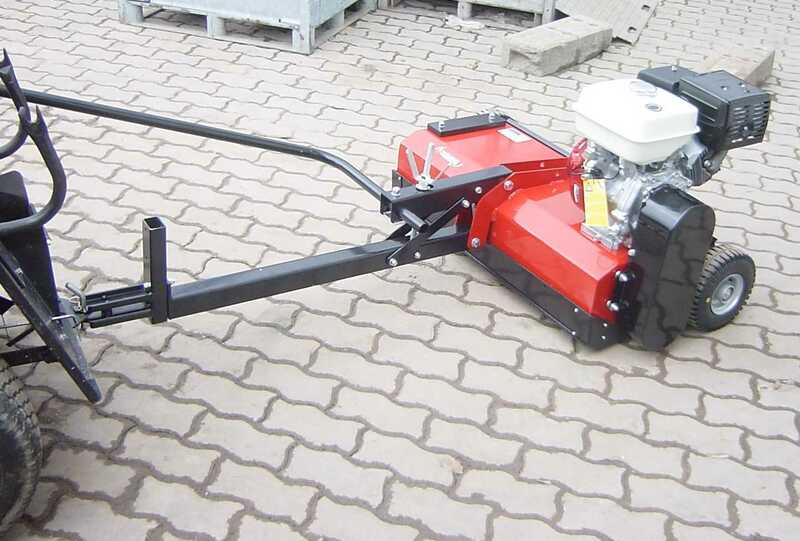 The most important technical detail is: it has 69 pendulous scarifier blades. This technical solution is most durable . 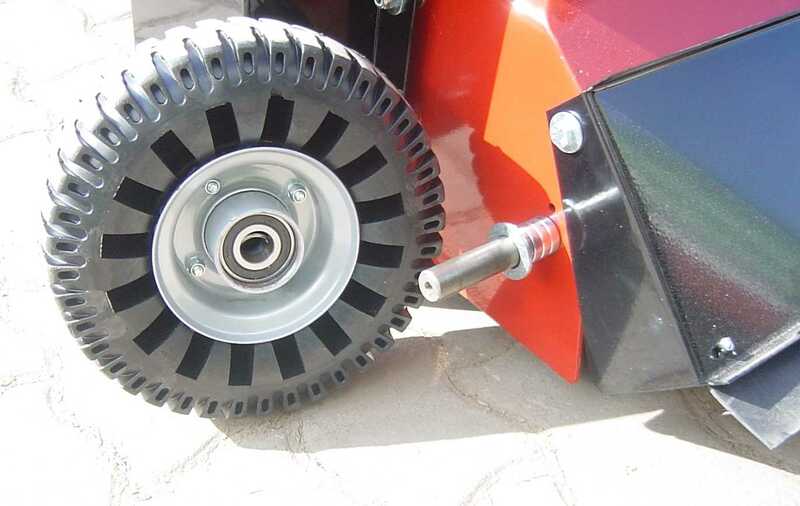 When the resistance caused by stones or similar foreign objects is too large, these blades flaps back easily. This system is more sophisticated, but with less wear and more durable - just quality! With spring equipped sacrifier shafts the springs break faster - with fix mounted blades at the blades shafts, the blades bend or even break. The blades are made of hardened material. The material thickness of a blade is 3 mm. This allows a long tool life. Competitors are satisfied with 2 mm. The blade shaft is supported by two maintenance-free, permanently lubricated large bearing blocks. The sacrifier box is made ​​of 3 mm thick steel. The ball-beared wheels are big sized. 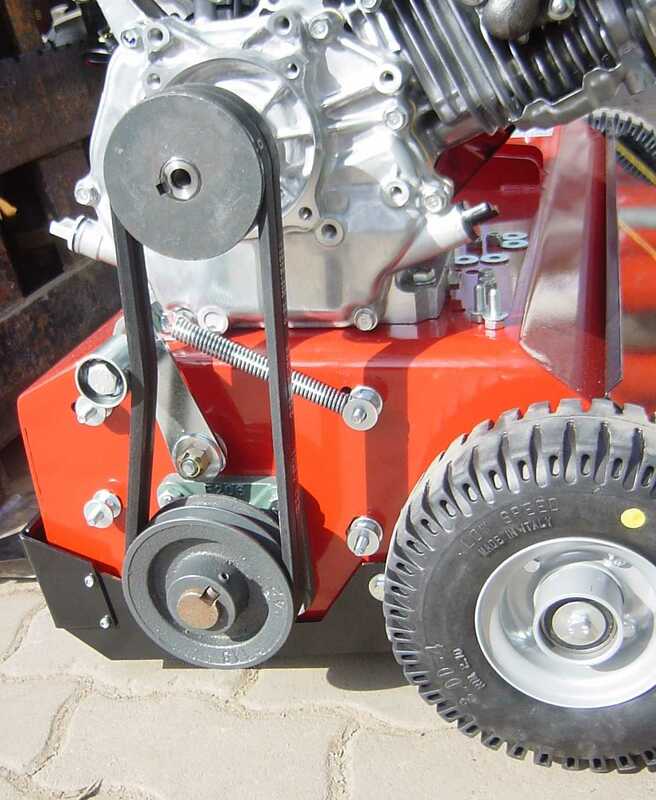 The wheels have a diameter of 25 cm and is 8 cm wide. Thus you achieve a high contact area. And the wheel is made of solid rubber - wheel size 3.00x4. The rims are made ​​of sheet steel and have double ball bearings. For this scarifier there is no collector. 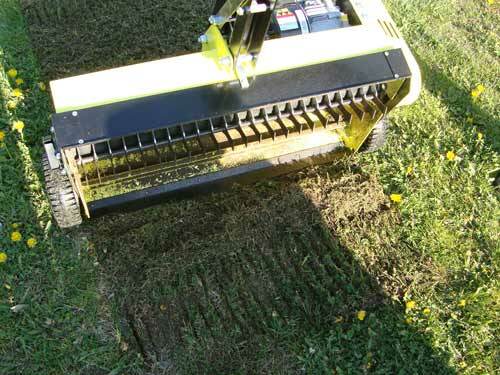 A catcher box is not recommended for a scarifier, because due to the low suction of air very little grass clippings are thrown into the collection box. 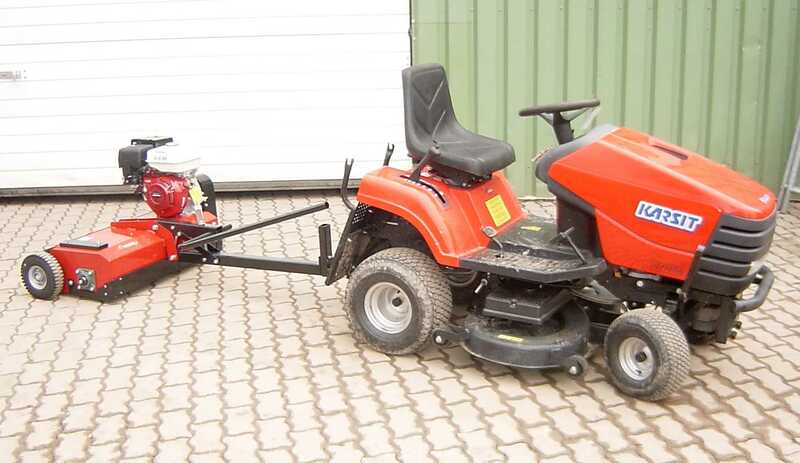 A powerful 6.5 PS Briggs & Stratton brand engine is used. Power is transmitted via 2 strong belts, which are stretched always - because of this there is no wear and tear! The working height can be easily reached by pushing down the rod and adjusting the screw. The rod is needed to leveraging the heavy scarifier. The setting of the working height is infinitely adjustable by the threaded spindle. 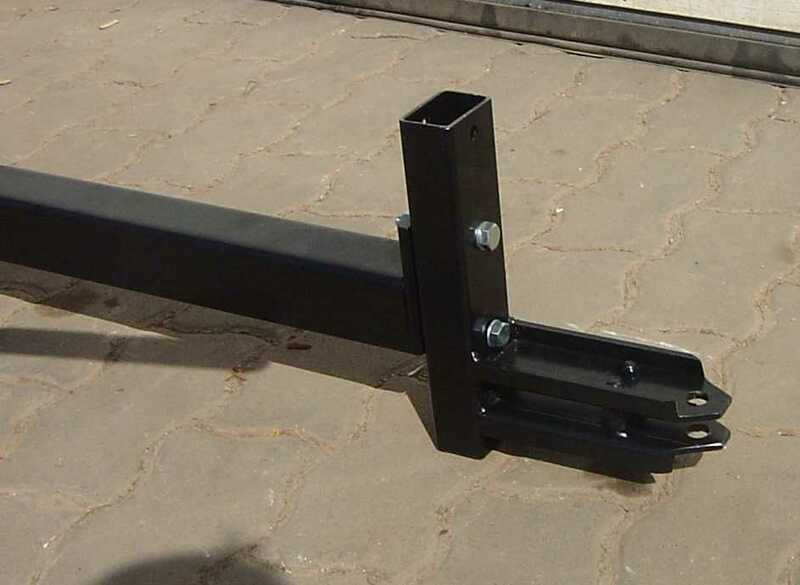 The towbar is 4 times adjustable in height and will fit to any tractor. In operation the procedure is as follows: The lifting rod of the scarifier is pushed down. 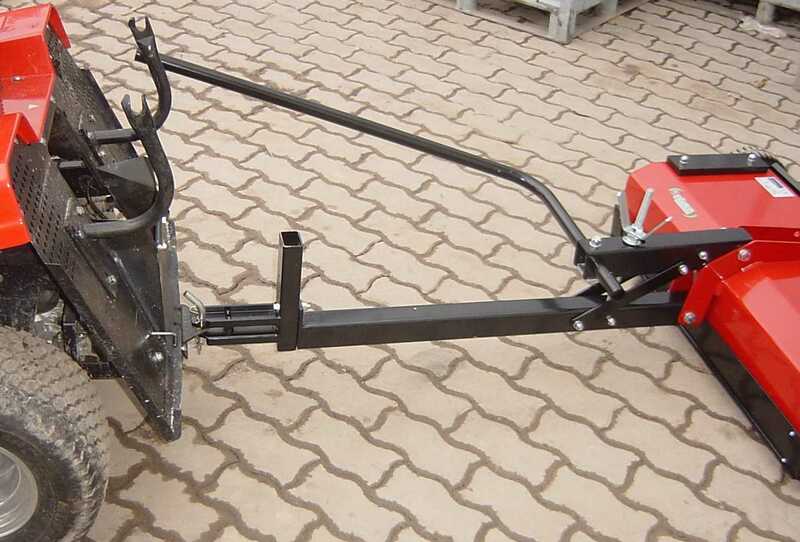 Thus, the scarifier is raised and is in the rest position and can be moved to any place. Via the threaded rod the working depth of the scarifier can be infinitely presetted. For operating the rod for lifting is pushed up and the engine is started - away it gos. 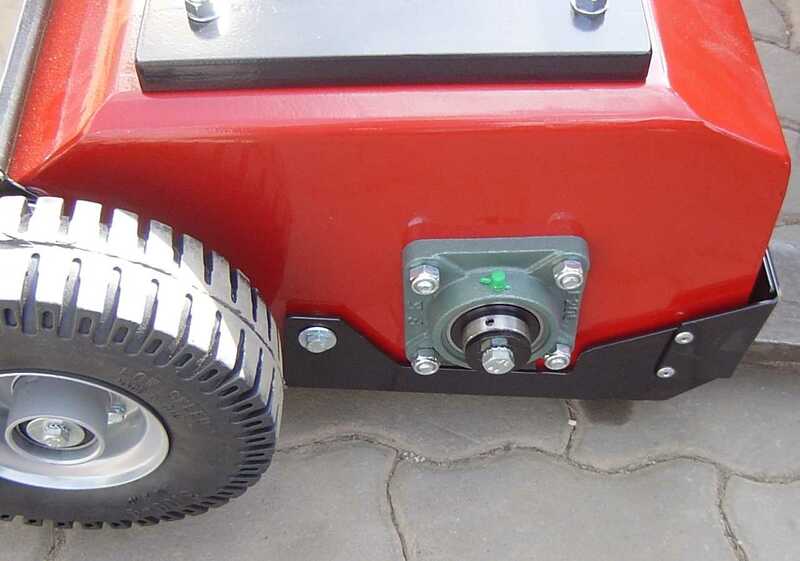 While driving the tractor, the by lowering or raising the lifting rod scarifier be placed in the rest or working position. 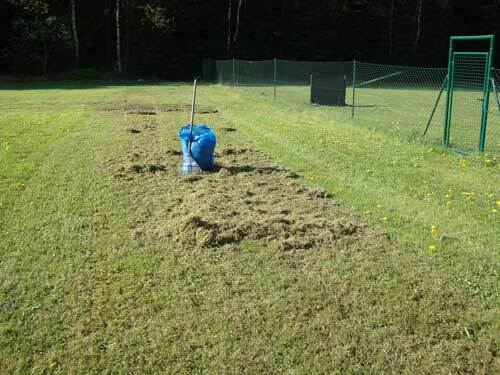 A clean and healthy looking lawn will be aired in good time, loosened and dethatched to prevent it becoming felted and suffocated. 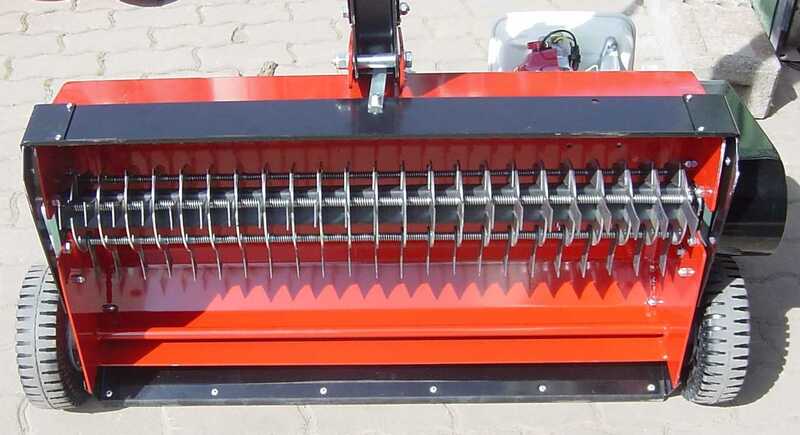 This scarifier remedies the situation by regularly dethatching ... from spring to autumn. to get nutrients and air. The grass suffocate. 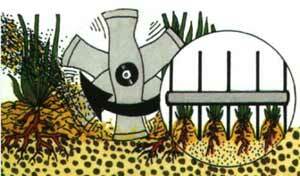 The rotating blades capture the thatch and pull it out. The thatch is removed, the ground is loosened up lightly. 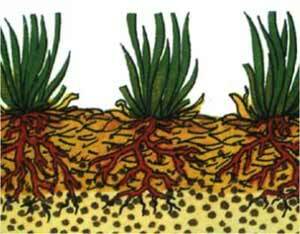 Water, nutrients and oxygen are returned to the soil. 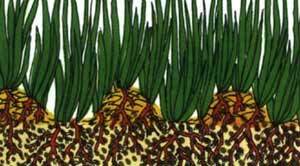 new, vigorous turf plants sprout. Here we have adjusted the scarifier too deep for testing it - it rips even the ground.